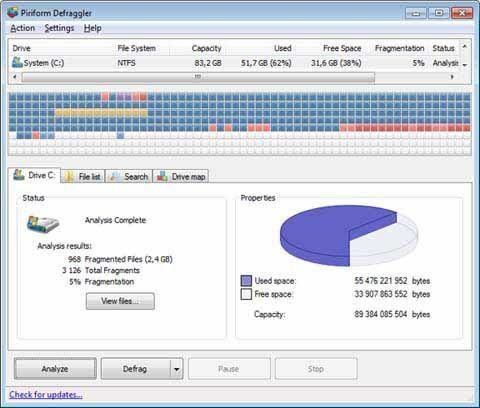 Free download Defraggler latest version. It is famous and free utility software that is also available in pro version to be purchased for better facilities and featuers. Defraggler is developed by Pirform and was released on August 18, 2008 for Windows operating systems. It supports all the windows operating systems i.e. the later versions, too, that were released after Windows XP. This utility software can also be installed as portable program using a USB flash drive. Defraggler supports many languages including English, Albanian, Arabic, Armenian, Bosnian, Brazilian, Portuguese, Bulgarian, Catalan, Chinese, Croatian, Czech, Danish, Dutch, Estonian, Finnish, French, Georgian, German, Greek, Hungarian, Italian, Japanese, Persian, Polish, Russian, Spanish, Swedish, Turkish and other famous languages. This utility software is used to defragment individual files or the folders on the computer systems. You can get a happier operating system if you are using Defraggler and periodically defragment your disk drives. The software can also defragment the entire disk if you are not limited to defragment a single file or folder (group of files). It contains three menus labeled as Action, Settings and Help. For a Pro Version go to help and click on “About” and then upgrade to pro.